Join this essential 3.5-hour tour of Madrid, accompanied by our official professional guide and don’t miss out on any of its cultural and historical highlights. Enjoy an effortless route on one of our agile and dynamic electric bicycles. 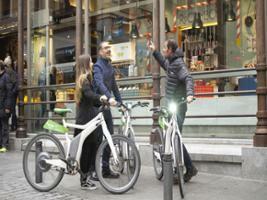 We have unique e-bikes in Madrid. 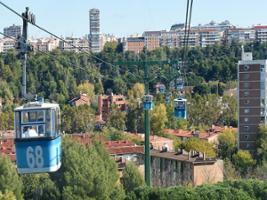 On the City & Parks route, we will climb to the top of Madrid on board the Madrid Cable Car, which will take us to Casa de Campo park, the city's true lung, and we will also be able to effortlessly visit and explore emblematic sites on this guided route such as the Royal Palace, Madrid's main square - Plaza Mayor, the Prado Museum and Retiro Park. Have fun and feel unique in your experience in a Premium Small Group tour, delight yourself with our farewell. 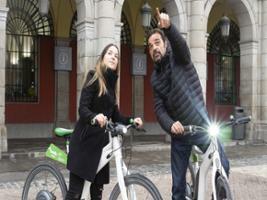 Madrid is the perfect city for touring and visiting by e-bike. Its splendid and hospitable historic centre with emblematic sites such as the historic market - Mercado de San Miguel, the Plaza Mayor, the Royal Palace. This and a sunny climate almost all year round, makes Madrid a perfect destination for travellers on wheels. Thanks to our unique and exclusive electric bicycles you can enjoy this guided route with no effort. Be amazed by the views of Plaza de Oriente, located between the Royal Palace and Teatro Real. Visit Plaza de la Armería to see the main access to the palace and the Almudena Cathedral. Ride to the top of Madrid on the Cable Car. Visit the parks Oeste, Casa de Campo, Madrid Río and the impressive Retiro Park. Avoid the traffic and travel through the capital city on a 3.5-hour route on which you will discover all the details on Madrid's culture and history, thanks to the entertaining explanations of our official guide. Have fun and feel unique in your experience in a Premium Small Group tour, delight yourself with our farewell. In the event that the cable car is out of service due to maintenance, we will include the climb to the Faro de Moncloa tower. The maximum weight allowed on the e-bike is 130 kg. Minimum Age: 10 years old.